Have you ever struggled to find a really good, basic recipe for something that you know will come out perfect every time? Pound cake has been that recipe for me. 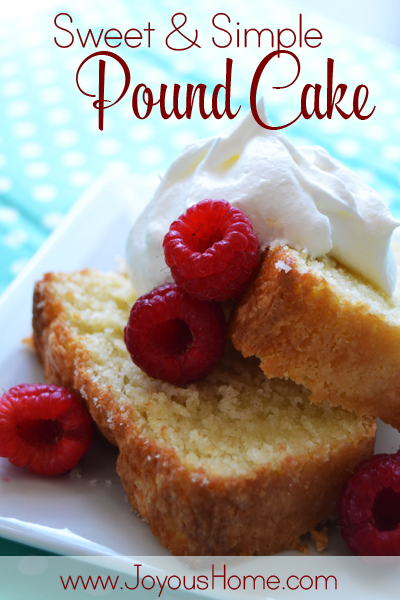 I’ve tried a lot of different things in my attempt to come up with a really good, but easy recipe for pound cake. 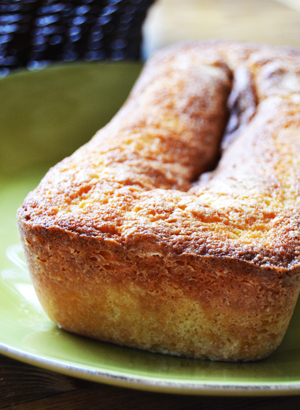 Finally, Sweet Simple Pound Cake has arrived! We were having company last week, and I decided to be brave and try again. I made a winner! One thing that has always bothered me about pound cake recipes is the absence of salt. It just tastes so flat, like a sponge. Perhaps that’s just how it’s supposed to taste and I’m just very ignorant of such things! I added salt to mine, but you can go the traditional salt-free way if you’d like. Preheat the oven to 350 degrees. Grease and flour your pan and set it aside. 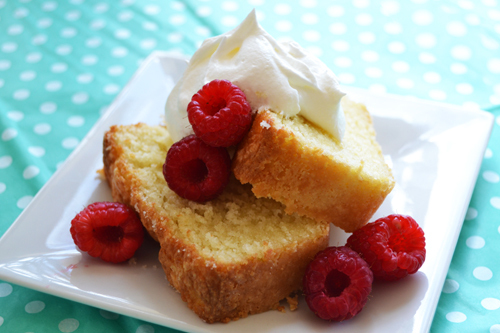 Don’t be tempted to skip flouring the pan, I’ve had many a pound cake stick because of it! Mix until well combined and creamy. Sift 1 1/2 cups unbleached white flour with 1/4 tsp. baking soda and 1/2 tsp. sea salt. Add flour mixture in thirds to the creamed mixture, mixing a little (not completely) after each addition. Blend just until the batter is smooth. Don’t over mix! 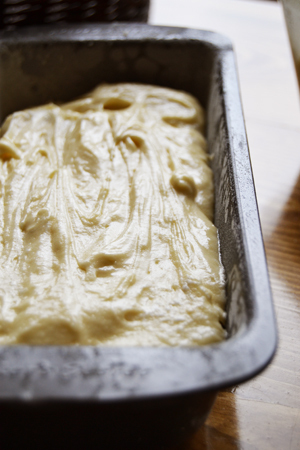 Bake for 45-50 minutes for a loaf pan, 1 hour or so for a Bundt pan. Remove from oven and cool in the pan for 10 minutes. Turn out on to a plate to cool completely. 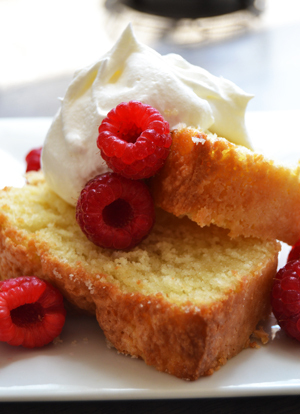 Serve with powdered sugar, whipped cream and fresh fruit!